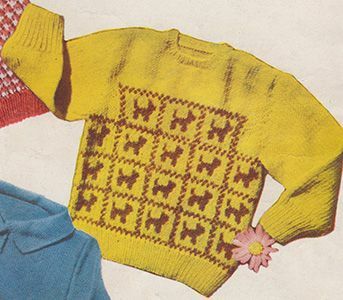 Note: While the sample garment is knit in yellow and brown, the instructions use white for the main colour and blue for the contrast. length of sleeve at underarm, 7 inches. ** Using smaller needles and white wool cast on 70 sts. Work in rib of K1, P1 for 12 rows. Change to patt. and larger needles. 1st row: * K1 W., 1 B., repeat from * to end. 2nd row: * P1 W., 1 B., repeat from * to end. 3rd row: * K.13 W., 1 B., repeat from * to end. 4th row: * P.13 W, 1 B., repeat from * to end. 5th row: * K.5 W., 2 B., 2 W., 2 B., 2 W., 1 B., repeat from * to end. 6th row: * P.3 W., 2 B., 2 W., 2 B., 4 W., 1 B., repeat from * to end. 7th row: * K.5 W., 6 B., 2 W., 1 B., repeat from * to end. 8th row: * P.4 W., 6 B., 3 W., 1 B., repeat from * to end. 9th row: * K.3 W., 3 B., 4 W., 1 B., 2 W., 1 B., repeat from * to end. 10th row: * P.3 W., 1 B., 4 W., 3 B., 2 W., 1 B., repeat from * to end. 11th row: * K.5 W., 1 B., 7 W., 1 B., repeat from * to end. 12th row: * P.13 W., 1 B., repeat from * to end. Repeat 1st to 12th rows twice, then 1st and 2nd rows once. 1st row: Cast off 4 sts., K.9 W., 1 B., * 13 W., 1 B., repeat from * to end. 2nd row: Cast off 4 sts., P.9 W., 1 B., * 13 W., 1 B., repeat from * to last 10 sts, P.10 W.
3rd row: K2tog. W., K.7 W., 1 B., (5 W., 2 B., 2 W., 2 B., 2 W., 1 B.) 3 times, 8 W., K2tog W .
4th row: P2tog W., 6 W., 1 B., (3 W., 2 B., 2 W., 2 B., 4 W., 1 B.) 3 times, 7 W., P2tog W.
5th row: K2tog W., 5 W., 1 B., (5 W., 6 B., 2 W., 1 B.) 3 times, 6 W., K2tog W.
6th row: P2tog W., 4 W., 1 B., (4 W., 6 B., 3 W., 1 B.) 3 times, 5 W., P2tog W.
7th row: K2tog W., 3 W., 1 B., (3 W., 3 B., 4 W., 1 B., 2 W., 1 B.) 3 times, 4 W., K2tog W.
8th row: P.4 W., 1 B., (3 W., 1 B., 4 W., 3 B., 2 W., 1 B.) 3 times, 5 W.
9th row: K.4 W., 1 B., (5 W., 1 B., 7 W., 1 B.) 3 times, 5 W.
10th row: P.4 W., 1 B., (13 W., 1 B.) 3 times, 5 W.
11th row: K 4 W., (1 B., 1 W.) 22 times, 4 W.
12th row: P.4, (1 B., 1 W.) 22 times, 4 W.
Work 20 rows white in stocking st.
Work as given from ** to ** for back. Using white wool work 14 rows in stocking st.
Work 6 rows in stocking st., dec. once at neck edge in 1st and 2nd rows . Join in wool at neck edge, and work other side to correspond. Join up right shoulder. Using smaller needles and white wool, with right side facing pick up 88 sts. Work in rib of K1, P1 for 4 rows. Using smaller needles and white wool cast on 40 sts. Work in rib of K1, P1 for 1½ inches. Work in stocking st., inc. once each end of needle in 1st and every following 6th row till there are 48 sts. on needle. Work without shaping till work measures 6½ inches from commencement. Then cast off 3 sts. at beginning of every row till 24 sts. remain. Sew up left shoulder for ½ inch at armhole edge. Make loops on shoulder. Sew on buttons. The original publication of this pattern is in the public domain. However, this updated version and chart are copyright Sarah Bradberry, 26th June 2014. All rights reserved.